The 2018 Farm Bill legislation that legalized the agricultural production and sale of hemp and hemp-extracted products has fostered a new boom for hemp-extracted CBD oils and other hemp-extract CBD products. With that growth has come a host of companies and brands looking to compete in this new marketplace. As with any market rife with competition, there are transparent and honest businesses and those that cut corners producing inferior products seeking a fast profit. In response, honest and transparent businesses are leading the charge in advertising their Certificates of Analysis ensuring consumers have as much information as possible at the point of purchase to make an educated and satisfactory decision. The market for hemp-extracted CBD products is so new that there aren’t yet quality or content controls or regulations on these products. One of the industry efforts to both provide transparency in product contents and combat the dishonest brands seeking to do the opposite is to encourage consumers to verify product quality through Certificates of Analysis: first or third-party lab reports detailing the contents and quality of tested products. Green Remedy makes all of our Certificates of Analysis available to our customers as we know that we produce only the highest quality hemp-extracted CBD products and our Certificates of Analysis prove it. The need for Certificates of Analysis is greater than ever before given so many companies are emerging in this new marketplace. 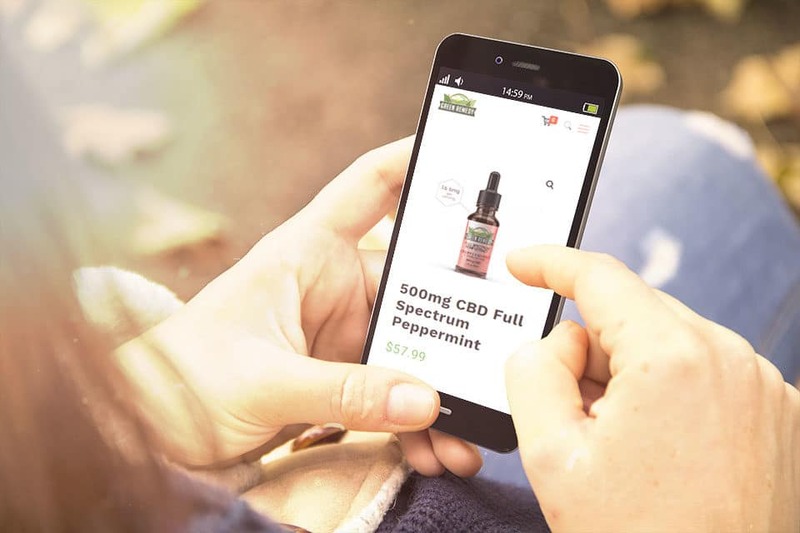 Because of the excitement in this new industry and the potential for CBD products to become a major economic force, there are several brands that are looking to exploit this attention for quick profit using shady business practices. These brands will often produce goods without labels, misrepresent their product with unfounded claims, conceal their certificates of analysis, or not produce them at all. The importance of a Certificate of Analysis cannot be overstated in such a competitive market with recent products from these shady companies testing positive for heavy metals and pesticides. These independent, third-party Certificates of Analysis are extremely important for consumers both to ensure they are receiving the product as advertised and also to provide them a way to safely purchase a product free of lead and other heavy metals, pesticides, and other toxins. Green Remedy’s Certificates of Analysis are provided by Pro Verde or other similar independent, third-party laboratories to give our customer’s the peace of mind that they’re buying only the safest hemp-extract CBD products available. Another reason that Certificates of Analysis are so important is because of the wide variety of products that are being produced with the hemp-extract CBD. Tinctures, lotions, edibles, and other CBD-infused products are being sold all with a variety of extraction and infusion techniques that have significant effects on the potency, effectiveness, and cannabinoid profiles. Green Remedy’s product catalog includes products that range from Full-Spectrum to CBD Isolate, so understanding the difference in the lab reports that these products produce is incredibly important for consumer information and safety. 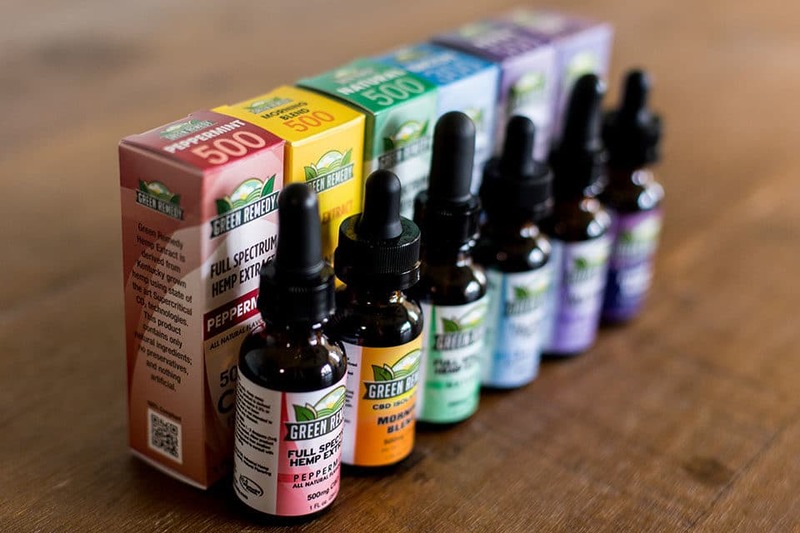 A Full-Spectrum hemp-extract CBD product will include the full array of compounds in the hemp cannabis plant including terpenes, amino acids, carbohydrates, vitamins, and other compounds. The inclusion of these compounds is thought to provide the “Entourage Effect”, the full benefit of the hemp cannabis plant where all of the compounds have a cumulative effect on the system. These products will also have trace amounts (less than 0.3%) of THC as this product does not undergo further extraction techniques to completely remove the compound. 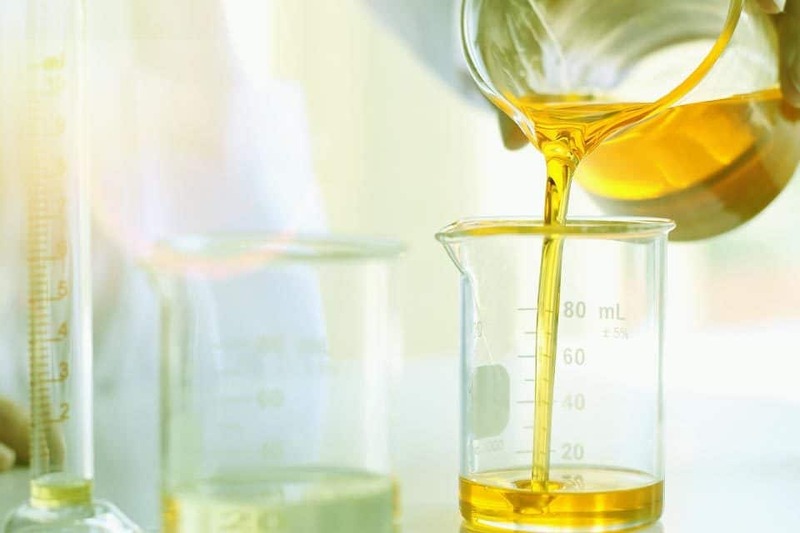 A hemp-extract CBD Isolate, however, will undergo further extraction techniques that remove all of the cannabinoid compounds that are not CBD. This product is thought to provide a milder effect and may have benefits for anxiety relief and mood enhancement. As such, the Certificate of Analysis for this product will have a smaller cannabinoid profile and should still pass all laboratory tests for harmful compounds and ingredients. The first major element to a Certificate of Analysis is the source of the report. Although a simple fact, it is an important one. There are two different sources for Certificates of Analysis: first-party reports are done by the company that has produced the product tested and are less trustworthy than a third-party lab that tests the product independently. Whenever possible, you should prefer or seek out companies that use third-party, independent labs to test their products and write their Certificates of Analysis. As for Green Remedy, our products are independently tested by Pro Verde or other third-party labs to provide more transparency for our customers and ensure they receive the safest hemp-extract CBD products. Another main component for Certificates of Analysis is the Product Profile and Potency report. This report section fully lists the cannabinoids in the product and their content levels in the product tested. 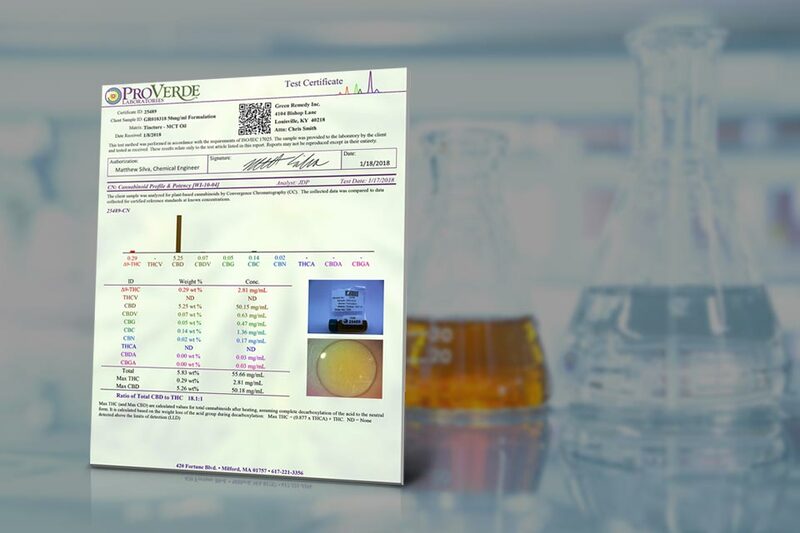 This profile analyzes the spectrum (full or broad) of the product as well as the concentration and potency of the compounds in the profile. A full-spectrum product will include a wide-range of cannabinoids and a trace amount of Delta-9 THC (less than 0.3%) while a broad spectrum product will retain the variety of cannabinoids with the THC further extracted. Some of the compounds on the product profile report will include CBDV, CBG, CBC, and CBN. An isolate product will further extract this variety of cannabinoids and retain only the CBD compound. The most important part of this product profile and potency section is to confirm the amount of CBD that is advertised on the product is reflected in the Certificate of Analysis. This amount is generally advertised in the mg/mL measurement and can be found in the concentration column of most Certificates of Analysis. Confirming this measurement on the Certificate of Analysis against the advertised strength of the product ensures that the consumer is purchasing a quality product and the company that produced it is accurate, honest, and transparent with their formulation. Some Certificates of Analysis may also include sections or reports that analyze the product for heavy metals, pesticides, fungicides, and other harmful toxins. These sections will break down the individual screenings by type, provide the concentration of any that may be found in the product, and whether these particular concentrations (if found) pass or fail regulatory or recommended standards. Certificates of Analysis are the best way in the new hemp-extracted CBD product marketplace to make sure that you’re receiving the best possible product for your money. Green Remedy CBD is a great way to supplement your daily health and wellness regimen with an all-natural and easy-to-take tincture or lotion and makes their Certificates of Analysis readily available for all customers. What Is the Difference Between Full Spectrum and CBD Isolate?